The Last Quarter Moon is Saturday March 26. Venus is visible in the morning sky initially in the constellation of Capricorn then in Aquarius. On the 27th Venus is close to Neptune. On the 31st the crescent Moon is close to Venus. Saturn is well placed for telescopic observation. 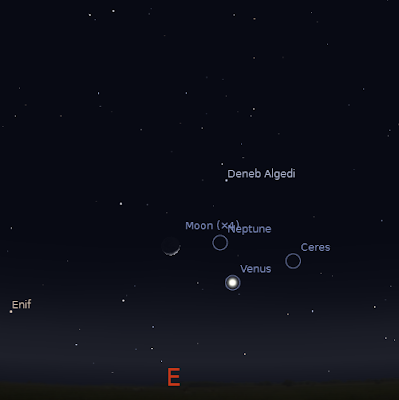 Morning sky looking east as seen from Adelaide at 5:30 am daylight saving time on Thursday March 31 showing Venus in Aquarius, not far from thecrescent Moon. Similar views will be seen elsewhere at the equivalent local time. Click to embiggen. The Last Quarter Moon is Saturday March 26. Bright white Venus is readily seen in the early morning sky. This week it moves from the constellation of Capricornus (just underneath the bright star Deneb Algedi) to Aquarius. On the 27th Venus is within 0.4 degrees of Neptune, you will need a decent aperture telescope and a widefield lens to see them both together. On the 31st Venus is close to the crescent Moon. 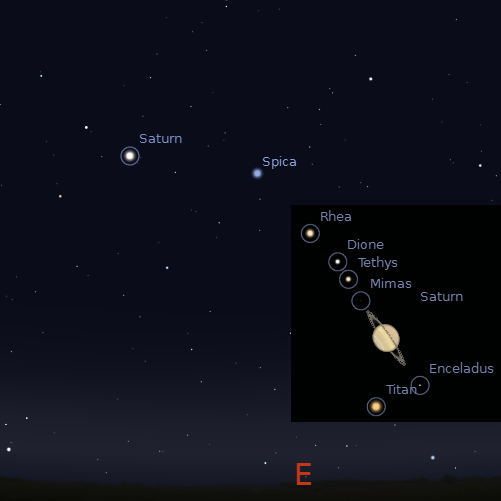 Evening sky on Saturday March 26 looking east as seen from Adelaide at 10:00 pm daylight saving time in South Australia showing Saturn near Spica. Similar views will be seen elsewhere at the equivalent local time. Inset, the telescopic view of Saturn on the 24t (and on the morning of the 25nd), you will need a fairly large telescope to see any moon other than Titan. Click to embiggen. Saturn is rising well before midnight, and is high enough for telescopic observation in the late evening, although it is still best seen in the early morning. It readily visible as the bright yellowish object not far from the bright star Spica. Even in small telescopes you can see Saturn's rings and it's moon Titan. Titan is close to Saturn on the 24th. The asteroid Vesta is quite faint (magnitude 7.6), so you need binoculars to see it and may need to watch over a number of nights to make sure you are seeing it. Currently Vest is not near anything interesting. Vesta is brightening and will be (just) visible to the unaided eye in a few months time. Mars returns to the morning sky by the 31st, faintly visible low in the estern twilight. Mercury is too close to the Sun to be seen. Jupiter is too close to the Sun to be seen.